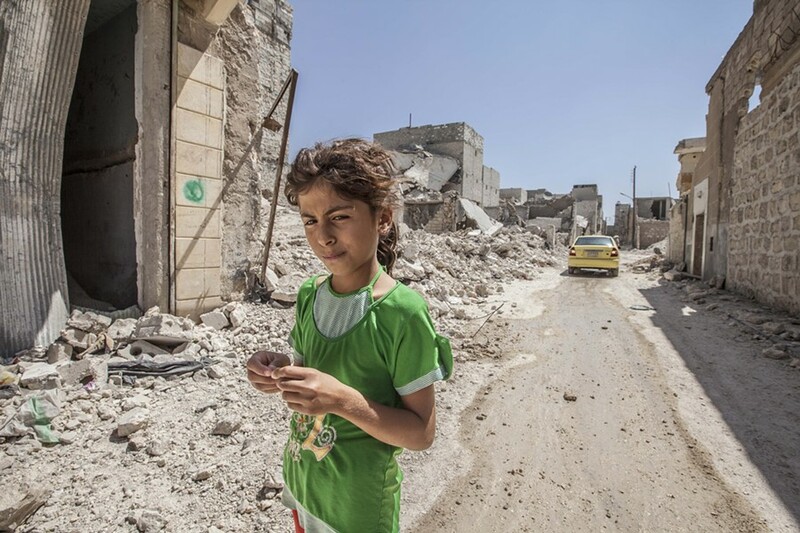 FACE OF WAR A girl walks through the rubble of a battered neighborhood in Aleppo, Syria. In mid-September, first-term U.S. Congressman Jared Huffman, D-San Rafael, was one of more than 80 lawmakers to vote against a bill that authorized $500 million for the arming and training of the Syrian Free Army. The bombs started dropping in Syria days later. I spoke to Rep. Huffman last week about his vote, and his thoughts on the widening war against ISIS. Do you think the president is acting legally in his actions so far, which are based on previous anti-terror authorizations that he is now invoking to justify the war against ISIS? Well, I don't like it. But I think the truth is those authorizations were very broad and the president is probably within his technical legal rights in this instance, but that doesn't mean it is the right thing to do. Where do you see yourself on the spectrum—dove, isolationist? I am neither an isolationist or a pacifist. But I'm also not an interventionist. I don't believe that we need to project military power all over the world all the time. My big takeaway from what we are going through right now is that this country has failed to replace the Cold War paradigm with any kind of new coherent paradigm that reflects our national security and national interest. So we are in a drift. How do we end the "drift"? We have to acknowledge that we lack a paradigm. What I hear from generals and others in classified and non-classified settings is that we are in this long war against radical Islam. People accept that as an article of faith, that that's the new security paradigm. I don't necessarily agree. There will be conflicts with radical Islam and other terrorist groups that may threaten our country from time to time. But the idea that we have to play a role in a 1,400-year-old conflict between Sunnis and Shias makes no sense to me whatsoever. You voted against the McKeon bill that authorized arming and training the Free Syrian Army. Any second thoughts? I appreciate that question. I'm not saying we should do nothing about ISIS. I think we should be part of an international response. I don't think we should launch an air war and then piece together a regional conflict after the fact, which is what we are doing. That was not my first vote on this subject. There was a previous vote to an amendment on the defense authorization . . . to prohibit the arming of Syrian rebels and I supported that, and I have in several instances co-sponsored legislation that would repeal the [Authorization for the Use of Force Against Terrorists], which I think is central to the problem. Speaker Boehner says the situation with ISIS might require American ground troops, but at the same time he won't write a war authorization bill. Has this war been politicized? There's definite politicization. That's coming from the fact that the marching orders from GOP leadership on every issue, all the time, are to start with criticizing President Obama. You just have to find a way to criticize first, and then find nuances. When they criticize him for not leaving more troops behind in Iraq, they are rewriting history. Or, everything would be fine in that region if we had armed the Syrian Free Army. It's the Cheney-Rumsfeld view of the world, and "Obama weakness" is the thread running through all of it. I think that is ridiculous and insults the intelligence and the rather recent memory of the American people. What would you tell President Obama if you could bend his ear? I would tell him that I'm afraid that he is missing an opportunity to rethink our interests and the broader security paradigm for our country in the modern world. I think he has allowed himself to be pressured into this long war against Islam, the default position being we must continue to project military power in that long war. Is there a threshold for you where you might support expanded military action against ISIS? Let me be real clear. I hope I am wrong. I'm rootin' for the United States. I hope this goes very smoothly and that all the assumptions that I think are suspect and wishful thinking, I hope they are correct, I hope there's a bunch of Jeffersonian Democrats in the Free Syrian Army, and they can step in and govern effectively—I hope that's all correct. I just don't know that it is. I hope we can stitch together an inclusive and tolerant country in Iraq, despite the hundreds of years of sectarian divisions and conflict, and the history of conflict in that region. But I have to tell you that I'm skeptical. I think it would be great news if this plays out in the best possible way for the U.S. and our strategy but I'm just afraid that it won't, and part of how it could unravel is the escalation of this conflict, drawing us deeper into the Syrian civil war, the inevitable civilian casualties and collateral damage. . . . I'm afraid we are starting down a path where there is no clear victory and no clear exit strategy. The choice is then to continue bombing at the cost of all sorts of humanitarian problems. I think a good, responsible U.S. policy would say to Turkey and Saudi Arabia and the UAE: ‘It’s time for you guys to step up an police a problem that’s in your backyard. We’re not going to keep fighting your wars for you. Obviously they have been unwilling to do that in part because some of those regimes are pretty tenuous and suspect themselves. Taking a hardline against the jihadists may lead to an Arab Spring in one or more of those countries. What are you hearing from constituents about your views and your vote against sending arms to the Syrian resistance? It’s been surprisingly quiet, though I have gotten support [for the vote]. It’s complex stuff. It s not as simple as, ‘You are either for war or against it.’ I think you need to explain your position, and the overwhelming response has been positive. I think I’ve gotten one letter critical of that position, which sort of suggests that we ought to be military involved. But even the support I’ve gotten on this has been more muted than with past war events. This one has been a little trickier for people. I think the beheadings shocked and horrified people. I think there’s a feeling among folks that are normally anti-war that something has to happen here—but I don’t think there is a clear sense of the path forward.